These proud short pieces heralded the glory of the U.S. studio or production company which made the picture you were about to enjoy. Indirectly these validated the institution of the studio, and were certainly ego strokes for the pioneer producers at the helm. Usually they were part of the assignment to score a particular motion picture. The recording was done at the same time as the rest of the film score. Copies were then spliced into the soundtracks of later films until it was time for a new arrangement or even a new logo. Originally these short musical signatures were written on assignment by master film composers working under weekly contract for the studios. Later independent composers would be contracted to write logos for modern production companies and TV networks. Origins of the "20th-Century Fox Fanfare"
The story is thus: Originally Alfred Newman worked for United Artists, whose company also distributed the films of Darryl F. Zanuck's "20th-Century Films." In 1933 Newman was named "General Music Director" of Zanuck's "20th Century Films". Correspondence with Ed Nassour, VP of Post Production for 20th-Century Fox verified that the original "20th Century Trade Mark" fanfare was recorded on the United Artists Soundstage 7 on the Santa Monica Blvd. studio lot, during the early 1930s (when Darryl Zanuck's 20th Century Films were being distributed by United Artists, but before 20th Century Films merged with Fox Studios.) Nassour said, "It wasn't until the early fifties that Newman made a new recording at Fox. He recorded the original version and it was used in a few select films." In 1953, when Cinemascope was introduced, the first picture to be filmed using this wide-screen technology was the Biblical drama "The Robe" which Newman also scored. But this religious epic used an appropriately solemn choral overture behind the opening visual trademark. No trademark fanfare appeared at all. The second film released in Cinemascope was the 1954 frolic called "How To Marry a Millionaire." Although composer Newman is a very big part of the opening of this film, it is in the role of conductor of his studio orchestra in the performance of an orchestral version of "Street Scene" as a concert overture. 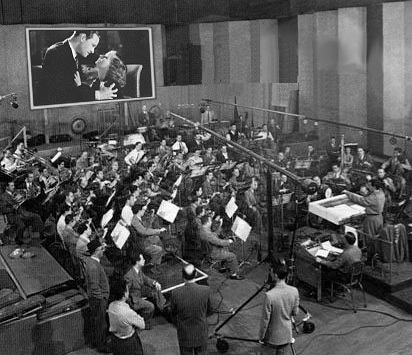 To make the Cinemascope format seem even more like an "event" technology, Mr. Newman and the orchestra are seen on-screen performing this "overture" in wide-screen Cinemascope before the action of the film begins. But the trademark fanfare is heard at the beginning in its earlier shorter length -- not yet extended for promoting Cinemascope. Thereafter Alfred Newman's musical TradeMark had the longer title of the "20th-Century Fox Fanfare with Cinemascope Extension". It also had a more definite ending cadence. Sometimes a theater would open their curtains even wider during the extension, to dramatize how much wider Cinemascope was than the standard 4:3 aspect-ratio screen used by earlier films, and especially by that nemesis of the motion picture -- the fledgling gadget called television. Ed Nassour writes, "The Cinemascope extension was recorded on six tracks, three with close perspective, left center and right and three with a long shot pick up with the microphones at the back of the stage. This was the normal setup for stereo recordings made at Fox. The [introductory] snare drums [actually military field drums, or "tenor" snare drums] were recorded on a separate pass and later mixed together. In 1997 David Newman conducted the Cinemascope version in a new recording to christen the reopening of our scoring stage now known as The Newman Stage. I had him do a new version of the TV logo that Lionel Newman had conducted for all those classic Fox TV series back in the sixties. Due to the severe time constraint placed on logo music by the networks (3 seconds) the orchestra played so fast that they sounded as if they were on helium!" Other Studio Logos had a more well-documented beginning. Franz Waxman's opening to MGM's "Philadelphia Story" (1940) included a fanfare for a new visual trademark. It was known from that point on as the "MGM Fanfare", replacing one composed previously by Leroy Shield (who also wrote the "Our Gang Comedies/Little Rascals" theme music). Even low-budget studios like Republic used signature pieces behind their trademark "emblems" shown at the beginning of their serials, and for episodic Chapter openings. Technologies besides Fox Cinemascope had their own logo too, as illustrated by the Signature IDs which were created especially for Cinerama, VistaVision, and NBC Color Television. Some trademark logos evolved as time went on. It almost seems like the influences of the individual film score and perhaps studio politics influenced this evolution of studio logos in some cases. For example, at a special collections archive containing film scores, I've had the privilege of comparing the manuscript scores of several Paramount films which began with the Trademark Fanfare composed by Nathan Van Cleave during the early 1950s. Mr. Van Cleave was the studio's main orchestrator during this period. This rather unusual and dramatic wide screen visual trademark had an equally dramatic musical treatment -- a polychordal melody, with bass and inner parts in a fugal contrary motion. This Fanfare originally included quotes of the earlier "Paramount Signature" of Janis and King used as the concluding motif of "Paramount On Parade". At the height of the wide-screen technology wars -- when VistaVision was challenging Cinerama -- the VistaVision Trademark Fanfare was expanded to a dazzling length and effect. When used to open "White Christmas" it even included a modulation to a glittering intro which then segued into the main song of the picture -- the familiar tune "White Christmas". This "sparkling" motif from the "White Christmas" intro was pretty effective, so it was then used for subsequent versions of the logo in later films but moved to the front of the logo. In later films, alas, this logo eventually was cut back to a shorter version after the novelty of the technology was less important to promote. It is sometimes called the "Paramount Seal" in later soundtrack recordings. When television arrived, the film studios which had TV divisions (Revue, for example, at Universal) commisioned logos to use at the END of their filmed TV shows (sometimes called the "hitch-hike" or "trailer.") Juan Esquivel (yes THAT Esquivel) teamed up with Revue music director Stanley Wilson to create one of the most identifiable TV logos for series distributed by Universal/MCA-TV. It's not clear how two composers are needed to collaborate on a piece of music that is only four measures long. [A later version expanded the logo to a standard "tune" length, so perhaps that THEME was the derivation which became the short logo...] In subsequent years, the 4-bar logo was shortened and re-arranged by Pete Rugolo, Jack Marshall, Quincy Jones and Robert Prince. In researching these compositions, I find it odd that relatively few of them were filed for copyright individually. Perhaps the studios felt since the music was so short and was associated with the visual logo, that the film or video treatment plus the music combined was more of a corporate ID than two separate works of art needing protection from infringers. Of course, some were part of larger film scores which may have been copyrighted. Copyright:    April 12, 1930; Eu 20 154. Renewal:      Mar. 18, 1958; R 210 944. [May have been a written for the "Fox Movietone Follies"
US Copyright: Dec. 31, 1934; EF 37 620. US Renewal:   July 13, 1962; R 298 171. US Copyright: Dec. 31, 1934; EF 37 622. US Renewal:   July 13, 1962; R 298 173. US Copyright: Apr. 5, 1935; EF 38 975. US Renewal:   July 13, 1962; R 298 193. US Copyright: Apr. 5, 1935; EF 38 976. US Renewal:   July 13, 1962; R 298 192.
used as a skit theme on Jackie Gleason's "American Scene Magazine." [title as seen on the sketch/score reprinted in "The Composer in Hollywood"
Unpublished Date:   Oct. 31, 1956; EU 456 146. Renewal     Date:   Feb.  9, 1984; RE 198 341. Films (Zanuck) Studio Orchestra at United Artists lot Stage 7. Copyright(s): ["A.B.C. Color Logo, Version 1"]: Oct. 30, 1967; EU 21 865. ["A.B.C. Color Logo, Version 2"]: Oct. 30, 1967; EU 21 866. Copyright:    May 22, 1978; PAu-22-006. A DIV. OF BING CROSBY PRODUCTIONS, INC.
Buena Vista -- see "Disney"
c/o CBS MUSIC OPERATIONS, INC. Copyright:    Jan. 26, 1968; Eu 33 954.
did electronic logos on early analog synthesizers. circa 1965 -- a trend that was to continue. US Copyright: March 3, 1965; EU 869 976. US Copyright: Nov. 24, 1969; EU 138 929. US Renewal:   March 7, 1997; RE 756 443. Copyright:    Feb. 10, 1978; PAu-1-448. Fox -- see "20th-Century Fox"
I T P (Independent Television Productions) -- see "Allied Artists"
Copyright:    as "King Features Opening"
March 21, 1963; EU 762 908. Copyright:    June 8, 1953; EU 319 350. Copyright:    January 2, 1968; Eu 31 384.
div. of T/Q MUSIC INC. Copyright:    Jan. 13, 1958; Eu 508 466. Copyright: Dec. 23, 1955; EP 100 480.
during the radio days onward...but they are the credits I could find. NBC Chimes", by Bill Harris, and in "More on the NBC Chimes", by Brian Wickham. from those of other networks and stations. should include a recognizable musical signature on chimes. But which melody? firm of Rangertone, which had previously produced electronic organs. So at NBC, the device came to be known as "The Rangertone Chimes Machine." resemble any mallet tuned-percussion instrument or piano. A rotating metal drum on which the reeds were mounted caused them to be "plucked"
sports or news events may have suddenly been interrupted by the chimes. timing which someone forgot to suspend. Service Mark (similar to a TradeMark) on the sound of the logo in 1950. TradeMarks and Service Marks are filed with the U.S. Patent Office. Supposedly, the NBC Chimes and the creaking door heard on "Inner Sanctum"
the death of the composer plus 50 years so his heirs could benefit. station-break "bumper" theme during the early days of the "Tonight Show"
and veteran arranger/conductor Alphonse D'Artega. was used as a theme for NBC Sports during the 1950s. Howard Shore wrote a nice short composition called "Theme on the Chimes"
used for NBC Network Primetime Movies from Fall, 1976 - March, 1980.
teletype effects was the Nightly News Logo. Grauer, and later the voice was that of Bill Hanrahan. chord. It was a dramatic (nearly melodramatic) signature. gels -- the kind used for stage footlights, and back-lit them from behind. friendship with the composer developed as a result. The following well-known signature was the second "living color logo"
was known for composing advertising jingles. Copyright:    March 1, 1966; Eu 917 158. Copyright:    May 22, 1958; Eu 525 620. Copyright:    Mar. 6, 1925; E 607 775. Renewal:      Mar. 13, 1952; R  91 748. Copyright:    Nov. 28, 1927; E 678 994. Renewal:      Nov. 29, 1954; R 139 929. This song incorporates Cicognini's "Paramount News"
Title:        VISTA VISION TITLE (incorporating "PARAMOUNT SIGNATURE"
Copyright Date: Nov. 16, 1955; EU 417 286.
on cue sheet in book, "Mystery of the Masked Man's Music"
Revue Television -- see "Universal Studios/MCA"
Title:        THE VOICE OF THE R.K.O. Copyright:    Dec. 16, 1996; PAu 2-068-877. Screen Gems -- see "Columbia"
Touchstone Pictures -- see "Disney"
Copyright:    March 23, 1965; EU 875 401.
cover all bases and cover his backside with the bosses. Copyright:    May 26, 1937; Eu 145 582. Renewed:      May 26, 1964; R  340 047. Copyright:    June 29, 1937; Eu 147 465. Renewed:      June 29, 1964; R  342 682. Copyright:    Aug. 7, 1937; Eu 150 243. Renewed:      Aug. 7, 1964; R  343 283. Copyright:    June 28, 1940; Eu 226 534. Renewed:      June 28, 1967; R  412 659. Copyright:    Sept. 15, 1942; Eu 309 807. Renewed:      Sept. 15, 1969; R  468 659. Copyright:    Sep 2, 1960; Eu 638 227.
a div. of MCA MUSIC, INC.
Orig. Claimant: Music Publishers Holding Corp. Copyright Date: May 17, 1930; EU  21 975. Renewal   Date: May 17, 1957; R  192 481. Walt Disney Pictures -- see listing under "Disney"
Copyright Date:  April 21, 1970, EU 176 463.